Pillsbury Baguette Chips - A Give Away! Today, I bring you - Pillsbury Baguette Chips! Looking for ways to spice up your snacking routines? Pillsbury knows just how you feel and wants to awaken your taste buds with their new Pillsbury® Baguette Chips! These hearty chips are sliced from oven baked bread and topped with savory seasonings bringing the unique and contemporary flavors of Italian Cheese & Herb and Cheddar Sun-dried Tomato to gourmet snack chips. The delicious flavors and perfect texture of these crispy chips can help you round out any recipe. Enjoy Pillsbury Baguette Chips for a wide range of occasions: eat them alone, add a bit more flavor to your favorite dip, spice up soup, or add some crunch to your salad! With 130 calories per serving (21 baguette chips), and 50% less fat than regular potato chips*, Pillsbury Baguette Chips are delicious snack chips that you can feel good about eating. What I loved about these chips is their small size - perfect for bite size snacking - and, NO DOUBLE DIPPING! Now there is a win! 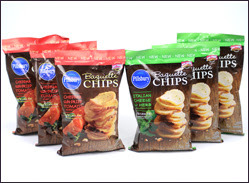 If that’s not enough to get your mouth watering, check out these delicious chips for yourself. Go ahead & download a printable coupon for $0.75 off one package, just CLICK HERE! Don't forget to check if your local retailer doubles coupons - ours do on Wednesdays and Saturdays! All you have to do to have your name thrown in the virtual hat, is enter via the rafflecopter entry form below! Thanks for stopping by - Good Luck!